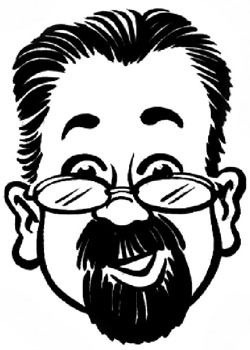 Glynn Edwards, Britain’s favourite caricaturist is one of the most talented caricaturists in the UK. Glynn Edwards, Britain’s favourite Caricaturist, has been travelling the world for the last 25 years, immortalising his victims from as far afield as Doncaster to Dubai. At a recent celebrity party in London Glynn sketched David Hockney, who kindly returned the favour and sketched him back as featured in the Daily Mail. In December 2006, Glynn was one of the few performers who entertained HM Queen Elizabeth at her private 80th Birthday party in London. Our caricaturists can move around the tables and draw your guests while they are having dinner, simply around the party or in a special area where guests can watch, be drawn and be amused by the caricaturist. Caricatures are black and white and take approx 5 minutes plus change-over time.